A starter since her freshmen year, junior Libero Marissa Ottesen (yellow jersey) earned first team All-Evergreen League honors for her performance this year and is one of the team’s co-captains. To earn a state championship in high school athletics, it takes more than a talented roster. Capital High School head volleyball coach Natalie Rhodes knows first-hand that talent alone cannot lead to a first place finish. As a player for the Cougar volleyball team in the mid-1990s, Rhodes was a part of the Capital squad that finished runner up to Selah High School in the 1994 3A state volleyball tournament. 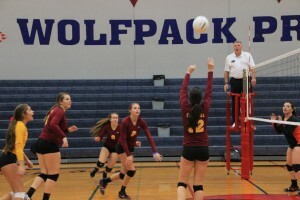 Capital High School junior outside hitter Rachel Erickson (in air hitting ball) was named the 2013 2A Evergreen League player of the year, a testament to her “terrific play in all areas of the game” according to CHS head coach Natalie Rhodes. Nearly 20 years later, that second place finish remains the best in school history, and since taking over the head coaching job at her alma mater in 2000, Rhodes has worked on bringing the program the illusive state title. Despite four straight trips to the state tournament prior to the 2013 season and a rich history full of all league players and league championship teams, the Capital High School volleyball has yet to make a serious run towards state championship game. This season, the Cougars have taken a big step towards acquiring that championship, as Capital brought home the 2A District IV Championship following a 14-3 regular season. CHS finished atop the Evergreen League standings. Capital must now turn their focus on this weekend’s 2A Tournament at Pierce College in Tacoma, where Capital opens with Pt. 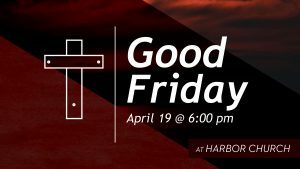 Angeles on Friday, Nov. 15. All season, Capital High School junior setter Samantha Yorke (#12 with ball above her head) has put her talented teammates in the position to make plays. Yorke’s play earned her second team All-Evergreen League honors and helped the Cougars win the 2A District IV championship. In last year’s state tournament, the Cougars went 1-2 with a victory over Sumner High School and defeats against West Valley (the eventual 2A state champions) and East Valley High School. Prior to the 2012 season, the Cougars competed in three straight 3A state tournaments, in which Capital finished no better than 1-2 for the weekend. Armed with a talented roster full of all-league performers and this year’s Evergreen MVP, Rachel Erickson, the 2013 edition of the Cougar volleyball team is hoping to make some noise against the state’s best. Two of Capital’s three defeats came early in the season. 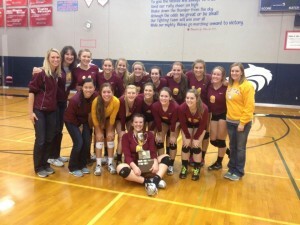 The Cougars dropped five set matches to Narrows League opponents Olympia (4A) and Timberline (3A), who each competed in their classifications state tournaments in 2012. These two match-ups, coupled with two standoffs against league foe Tumwater (the two schools split the two regular season matches) and state power Burlington Edison High School in the Capitol City Tournament in October and the run in the District IV tournament, have prepared the Cougars for the intense competition they will face this weekend. 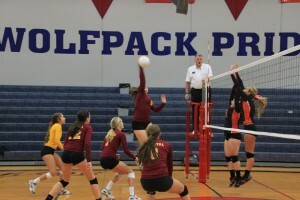 The Cougars started the season 0-2 following the back-to-back losses to Olympia and Timberline. After five straight victories, Capital hosted Tumwater on Tuesday, Oct. 8, giving the Cougars a chance to measure themselves against the T-Birds, who have finished runner up in the 2A State Tournament the last two seasons. 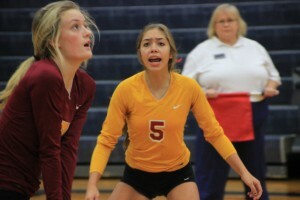 On that night, the Cougars would drop their third five-set match of the season, this time against their league rivals. However, the loss would prove to be a turning point in the Cougar’s season. 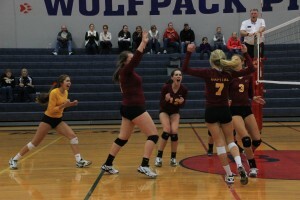 Since the loss to Tumwater, the Cougars have won nine straight matches, including a 3-1 victory over Ridgefield High School in the district championship. After last year, when the Cougars lower seed forced them to play against West Valley in the first round, Rhodes and her players know how crucial winning the district championship is to the Cougars title aspirations. What differentiates the 2013 Cougar team from those in past years? Rhodes and Erickson point to team camaraderie and experience. Rhodes has seen the CHS program rise, fall and erupt towards the top again during her time as a coach and player, and believes the work ethic of her and the coaching staff laid the foundation for the Cougars five straight trips to the state tournament. How high can the Cougars reach this coming weekend? That remains to be seen. But thanks to an experienced coaching staff and roster, the Cougars won’t have to rely on strictly talent.